Glyndwr's Way is a 135 mile national trail through Mid Wales, beginning in Knighton and finishing at the canal in Welshpool. 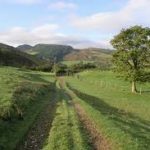 The route is recommended as a 9 day trail, although it can be achieved in stages, and visits towns such as Knighton, Llanidloes and Machynlleth. On the way the walker will experience the beautiful Mid Wales countryside, from wooded valleys to bleak moorlands with panoramic views. Welshpool Tourist Information Centre stocks several guide books covering the walk as well as souvenir items to purchase as mementoes.